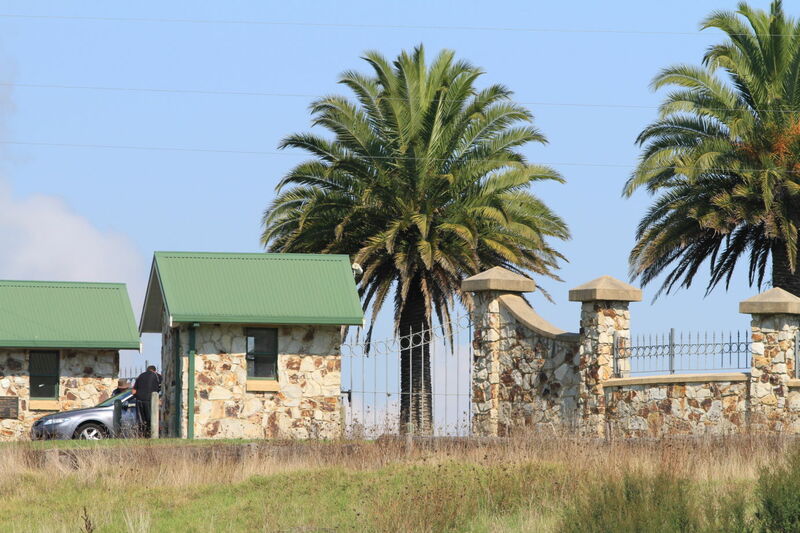 Willow Grove Recreation Reserve is one of the more attractive country football grounds to visit. A short distance from Blue Rock Lake, the home ground of the Hill End FC was in magnificent condition for the opening round of the 2014 season. 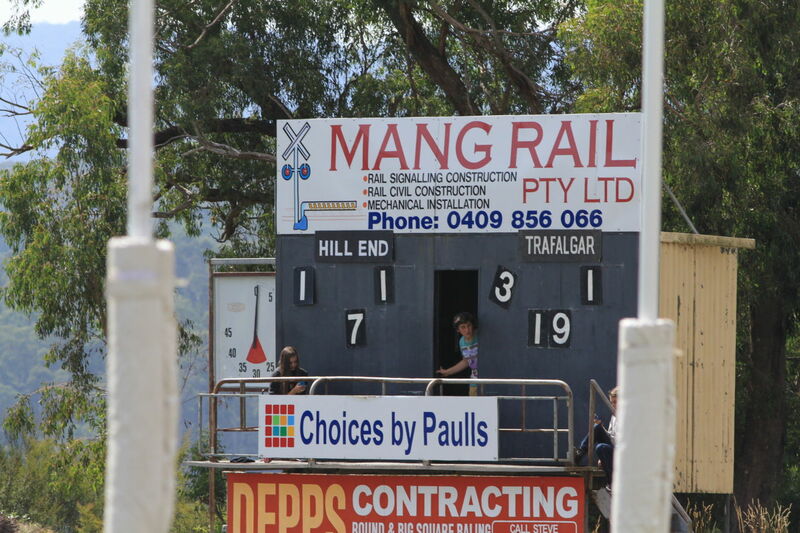 The scoreboard shows an early lead to the visiting Trafalgar in the first quarter of the reserves game. The middle picture shows a scene from the thirds game. I like the expression on the face of the Hill End player, who throws his hands in the air as Trafalgar break away once again. Its also good to see a couple of excellent non-AFL guernsey designs like these. 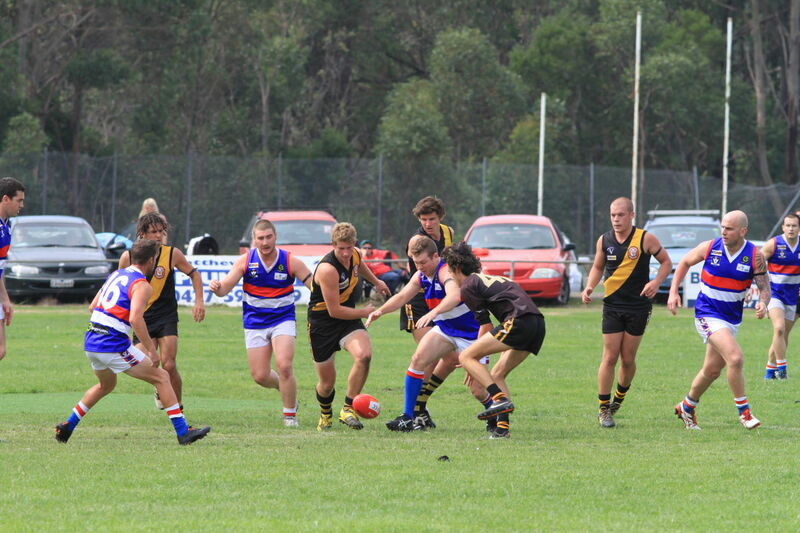 Then it was off to Mirboo North for the senior game against Newborough. 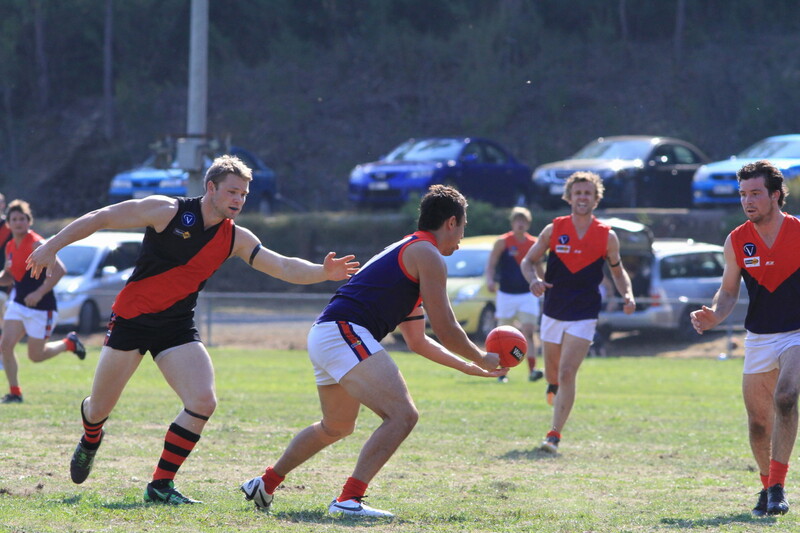 The Tigers had narrowly beaten Newborough in the 2013 grand final. There was never any prospect of a repeat result here however, as Mirboo North was severely depleted (due to a wedding amongst other things). 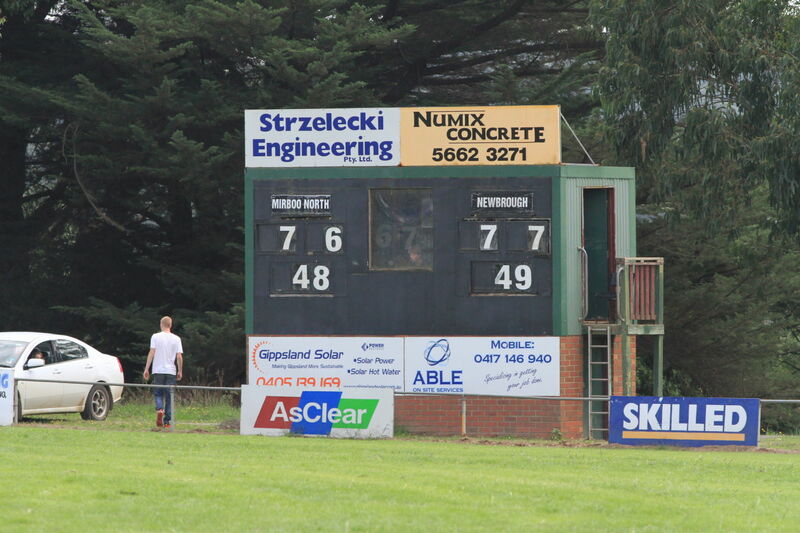 The first picture shows the scoreboard late in the reserves game. 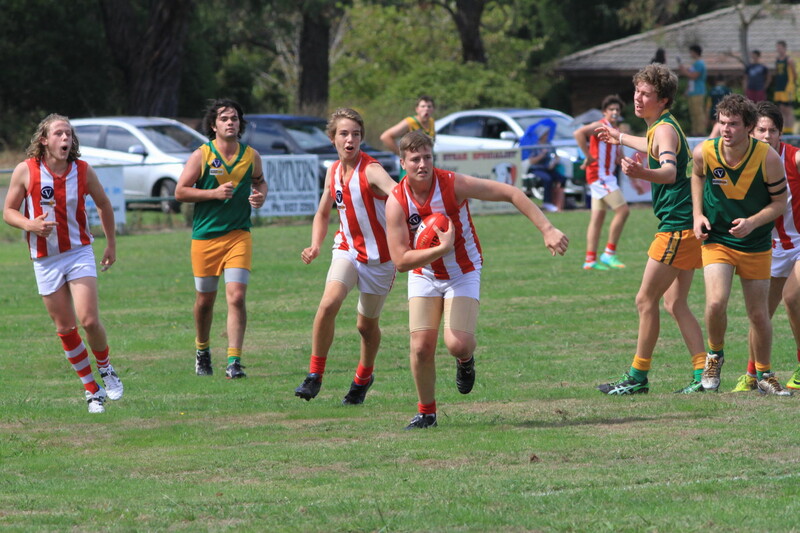 The senior match was very one-sided, as shown in the third photo, taken in the diffused late afternoon light. 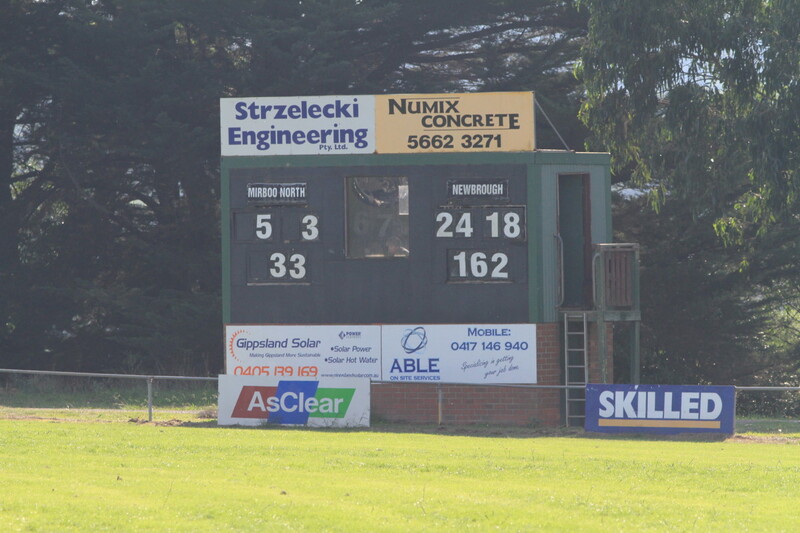 It is interesting to see that the Mid Gippsland League scoreboards show the name of the visiting club instead of just ‘Visitors’. Even if the name of the visiting team is spelt incorrectly as it is here. Anyway, the Bulldogs were most impressive and must be a big show for the flag this year. 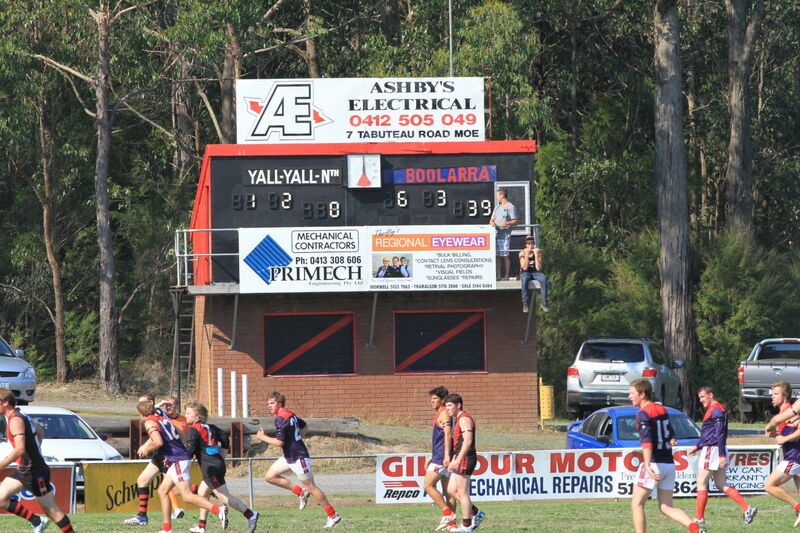 And to round out our Mid Gippsland scoreboard feature, let us head out to Yallourn North for the opening game of the 2013 season. The George Bates Reserve is an impressive venue, positioned in a natural basin that allows for elevated views all the way around the ground. And look at those entrance gates in the third picture! What a great place. 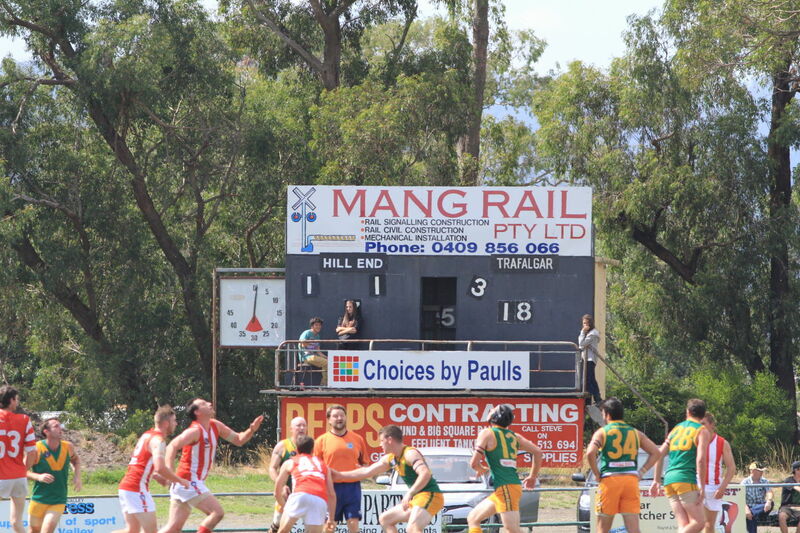 No tin numbers are required for this scoreboard, perhaps at the cost of a little legibility. Boolarra gave the Bombers a thumping on this day, and the combine ended up last on the ladder. Lets hope that the club has a bit more success this year. Yallourn-Yallourn North was formed after the former Latrobe Valley FL club, Yallourn merged with Yallourn North (formerly Brown Coal Mine) after the town of Yallourn was demolished to make way for an extension of the open cut coal mine. Excellent combination, Meike, of photos and anecdotes, of footy and local history. Must have been a very pleasant day out indeed.